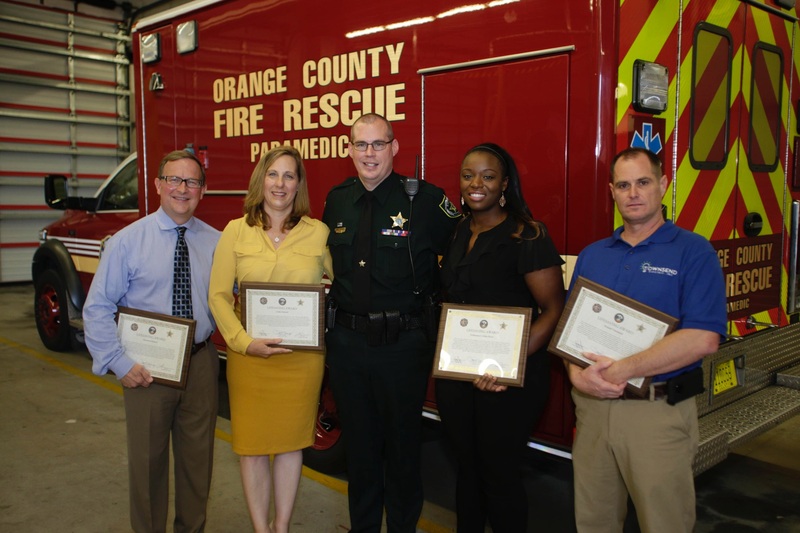 Four local good Samaritans were recognized today for saving the life of Orange County Sheriff’s Deputy Sgt. Jamie Hoffman from a fiery crash last year on State Road 408. On the morning of July 1, 2018, Sgt. Hoffman’s patrol car crashed on the 408 between Pine Hills Road and Old Winter Garden Road. His cruiser burst into flames and Sgt. Hoffman was rendered unconscious from the crash. Four good Samaritans sprang into action and saved his life by pulling him out of the burning car. Mayor Jerry L. Demings joined Orange County Fire Rescue Fire Chief Otto Drozd, III and Orange County Sheriff John Mina with Sgt. Hoffman to honor the local residents in a special presentation on Feb. 7, 2019. For the first time since the accident, Sgt. Hoffman was reunited with the good Samaritans and the crews from Fire Station 30 who responded to the crash. “From the bottom of my heart, my family and my agency, I thank you for your bravery that day,” said Sgt. Hoffman to the four heroes. The good Samaritans included a husband and wife, a military veteran and a nurse. 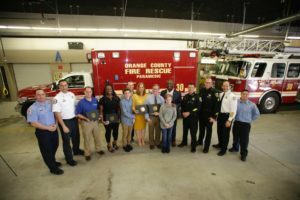 The recognition event, hosted by Orange County Fire Station 30 in Orlo Vista, honored each hero with a Lifesaving Award.